Welcome to the Virtual Tour of Downtown Vallejo! 1 Begin your tour by clicking on the Vallejo Downtown area of interest below. 2 360° Panoramic Photos are available by clicking on the dots. 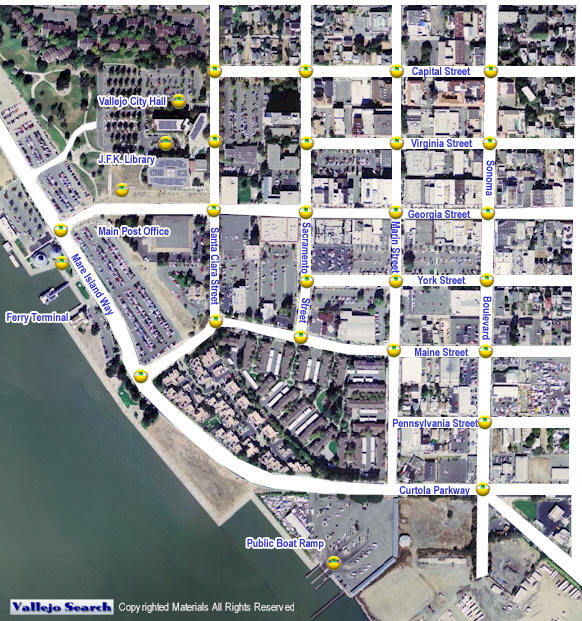 As we include more individual downtown Vallejo city blocks you will be able to click on an active downtown block and have access to individual downtown shop and business information. Most the Downtown Vallejo businesses will be listed with the address, phone number, their website link and interactive map. Begin by clicking an area of downtown Vallejo below. Capital & Santa Clara St.
Georgia & Santa Clara St.
Maine & Santa Clara St.
Curtola Parkway & Sonoma Blvd.